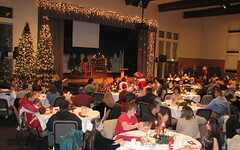 Every year our church sponsors an Angel Tree Dinner. Children of incarcerated parents are invited to a dinner where gifts are given to the children on behalf of their parent. The incarcerated parent makes the request for their child to take part; and sends a note to be given with the gifts. The church buys the presents and puts on the dinner and then presents the gifts This year Esther and I had the opportunity to host a table. Guests are not assigned to tables but hosts greet families as they enter and then invite them to sit at their table. As families entered, I recognized one of my students in a large group of guests and knew it was my clue! As it turned out, not only my student but one of his cousins who was a former student, sat at our table. I was not aware that either of them had incarcerated parents. It was a special moment when the children opened up the notes from their parents before opening the gift. The church also helps pay for the children to go to summer camp. The custodial parent can sign them up. It looks like both of my students will be able to go this summer. It is humbling to be a small part of something that God is so obviously orchestrating.